You need to adjust how you look at the world and put the situation that is causing you stress into perspective. 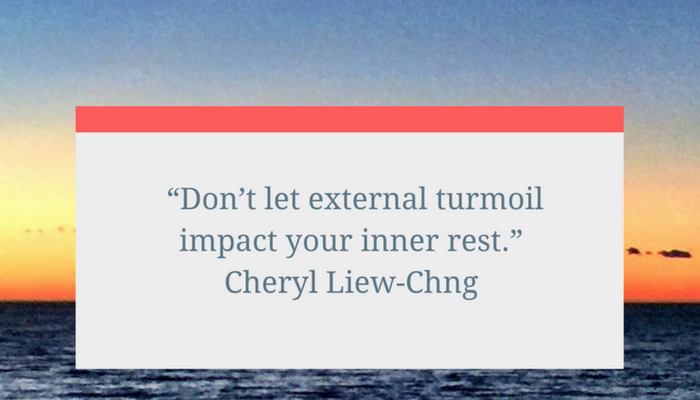 “Don’t let external turmoil impact your inner rest,” said Liew-Chng. Adjust your lens, so to speak, and allow yourself to see the real cause of your stress. The external factor that is causing you stress may not be worth all the concern you are placing on it. A new perspective will help you see its impact. According to Liew-Chng, “When you are organized, there’s less stress.” The more things are in order in your life the calmer and more collected you will feel. You need to have systems in place and things in order so that your life is stress-free. Chaos creates stress, and with a little organization in your life, you will feel the stress start to dissipate. Taking a deep breath can help you to take a moment and allow you mind to focus. When things are beginning to overwhelm you, you need to reduce that anxiety by gaining perspective and taking a deep breath will help you stop for a second to regroup. This brief pause is all you need to clear your head and move forward with your actions. “If you are feeling stressed move away from the stressful environment and then come back to it,” says Liew-Chng. Getting away from what is causing you to be stressed can allow you to regain control of the situation. Simply walking away for a moment can do wonders to reduce your stress level and allow you to tackle the situation again with fresh eyes. Keeping these tips in mind when you are feeling anxious and agitated by stress can help you manage and control its effects on your mind and body. Not only will you sleep a little better each night, but you will live a more productive and healthier life. Hey there, Cheryl here. I’m going to be drilling into a topic that has been commonly asked today, and that has to do with … “Cheryl, how do we do with stress? How do we deal with stress?” Well, stress seems to be a modern ill, isn’t it? Have you ever felt that before. Just before a big presentation, you are stressed. Just before a big interview, you are stressed. Just before a major house move, you are stressed. Just before you begin a new job, you are stressed. Well, stress can be good, if you manage it; or it can be detrimental, if you don’t. Stress is good because it gives us impetus. It also put us a little bit on the edge, for us to make sure that we are on our toes for that certain major or big event that’s happening. On a long-term basis, it is definitely not good for our health. Where stress is not good for us, is that it is bad in terms of us having anxiety attacks, or it can be bad because we can’t get a good night rest, or it can be bad because stress cause us to be snappy and edgy with the people around us. Here’s the other reason why we need to manage our stress, and that’s to avoid burn out. A couple of ways that we can do that, and I have got it right here. I have, let me share with you, four different ways that you can manage stress; and you can start right now. I believe this is important, because you have great ambitions and you have big goals. You can manage your stress, so that you can truly be vibrant, moving towards your goals, and having that momentum. #1… What lens do you use to see your world? 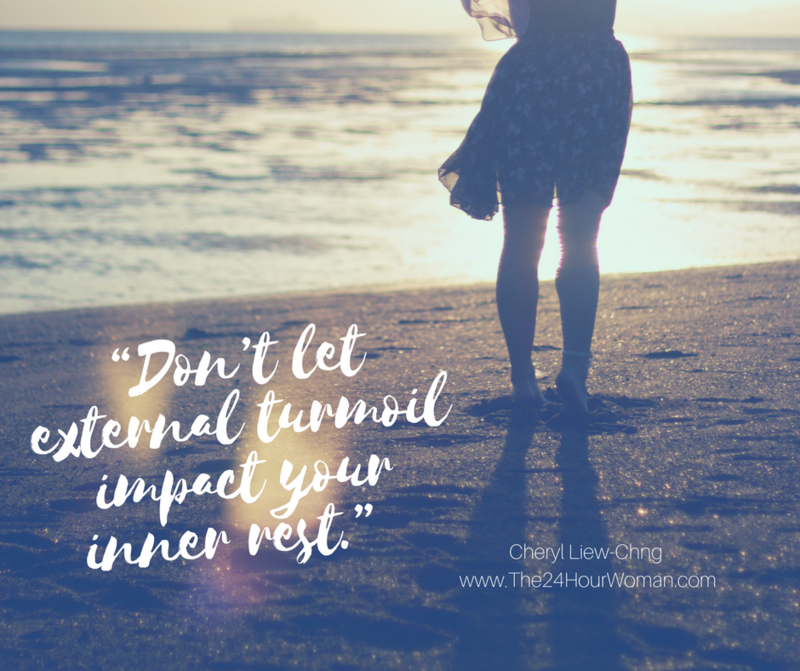 You’ve heard me say before, do not let the external turmoil impact your internal rest. That’s about managing your stress. Don’t let whatever is happening outside impact you in having that calmness and that single mindedness to pursue your particular goal. Having that lens, having that perspective that … [Well 00:02:26], what is this? What is that that’s causing that stress? Arresting that is going to be key for you to manage it, so that it does not amplify, right. Put that stressful event, or that stressful incident, into perspective in the context of things that’s happening. That’s number one. #2…get organised. Very often, your stress is because things are all over the place. Things are not scheduled. Things are not ordered; therefore we are stressed. When you need to look for something, it’s all over the place. When you get into an event, things are not in place, not scheduled. There’s no systems. Once you get more organised, there is less stress. Not that there will be no stress; there is less stress, because it is more managed. There’s more control, all right; so get organised. #3 … Yes, take a deep breath. When you feel stressful, or you think it is going to be a stressful day; again, the lens by which you see your day. You think it is going to be a stressful day, stop, put things into perspective, take a deep breath, and think, right. Put it in perspective. Breathe. When you take deep breaths in, you calm yourself down, you get your mind thinking and focusing again. Take a deep breath. Right. Breathe with me right now, and out. Breathe in, and out. Right. That’s all you need to do. One of my clients used to go into a very stressful state. She could stress herself out two, three days in a row in anticipation of something that probably would not happen. That’s not putting your things into perspective, in your lens again. What I tell, when I worked with her, whenever she feels that, stop. Put everything down and breathe, right. It’s managed the number of times where she goes into a state of turmoil or anxiety or frenzy, just because she can manage her stress better. #4…Change your environment. If you’re feeling stressful move away from the environment that you are in right now. Go take a walk. Go take in a different sight. Go change of scenery. Move yourself away from the stressful environment. It can be you’re about to get in a stressful situation with your spouse, with your children, with your teammate, with your boss; remove yourself from that environment, and then come back to it again. Right. These are four ways that you can better manage your stress. First, is your perspective. What lens are you seeing through when you get yourself into that stressful environment, or that stressful situation, or you think it is going to be stressful? Get organised. When you’re organised, it is less stressful, because there’s less unexpected things that thrown up at you. Next, breathe. Remember to take deep breath. When you take shallow breath, you just build up the sense of anxiety; and that rapidness enters in your breath, and randomness in your head. Finally, change your environment. When you feel that you are stressful, or that stress is coming up, or you are going to get into a stressful argument situation; move yourself. Remove yourself from that particular environment, and then come back and deal with it again. My name is Cheryl, and I know that you can put these four into practise and better manage your stress; so that you can truly enjoy what you’re doing, so that you can truly be engaged with the people that you’re in, you know together with in your journey, and so that you can truly live a life that is happy and enthused and passionate about. My name is Cheryl. Until I see you at the next episode, I want to wish you a life that is most excellent.